I wanted to post a review of Umcka, a homeopathic cold and flu remedy, because I’ve had unexpectedly good results with Umcka. Umcka reduced the severity of my last three colds and they were over in days rather than weeks. The active ingredient in Umcka is Pelargonium sidoides root which originate from traditional South African medicine where it’s been used to treat a variety of ailments, including the common cold. Umcka comes in quite a few flavors and forms, including syrups, drops, tablets, sprays, and lozenges. I don’t catch a lot of colds and I attribute that to a strong immune system resulting from the paleo style diet I’ve been on since around 2009. In fact, I had a stretch where I went almost five years without a cold… however after spending time in Hong Kong, and incredible place full of modern and ancient adventures, I realized that catching a cold is inevitable. Hong Kong is dense with people. One person with a good sloppy sneeze will infect an entire crowd. I’m sure I caught two colds this way and the first of them really knocked the wind out of me. My job in Hong Kong was playing music at a hotel at night, and I was miserable and barely functioning. I had to get rid of the cold, and fast. I wandered over to a little organic/natural store in the SOHO area called Green, and that’s when I discovered Umcka. The Umcka instructions say to start taking it as soon as you feel a cold coming on, but in this case my cold already had a strong foothold. Since I had nothing to lose, I bought it anyway. After two days I felt some relief and although I can’t say for sure it was the Umcka that did it, I decided to try it again next time I had a cold. The next time was sooner than I thought it would be and two months after my first cold I had the opportunity to try Umcka again. I started taking it as soon as I felt the cold coming on and this time my cold lasted less than a week. In five days the major symptoms were completely gone and the only thing left was a bit of nasal congestion. I flew back to Bellingham a week ago on Monday, Jan 4th, and it seemed like most of the people on the flight were coughing, sneezing, sniffling, and otherwise completely sick. I thought having extra cognac might help me escape a new cold, but by Friday I was knocked out by a stifling cold. I found some Umcka here in Bellingham and started taking it right away. Now it’s Tuesday and due to lingering jet lag, it’s 4:30 in the morning and I’m writing a blog post. However, my nose is mostly clear, I’m barely coughing, I have energy, and my cold is almost gone. 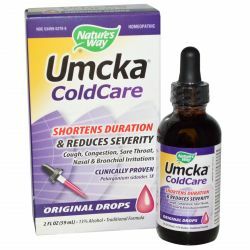 From personal experience, I highly recommend giving Umcka a try next time you feel a cold coming on. Follow the instructions and start as soon as you think you’re getting a cold and let me know if it helps you as much as it has helped me. The Umcka links on this page go to iHerb.com, my favorite online natural product and personal health store. In addition to a great inventory, the fact that they ship to Hong Kong and other places around the world for incredibly good rates is a bonus. Umcka a South African traditional remedy where it’s been used to treat a variety of ailments, including the common cold, and it works for me.